Best for: All Preperation time: 1hr appx. 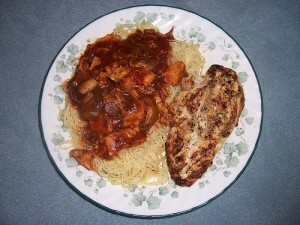 Chicken Steak With Red Sauce recipe by Hira Sheikh at DesiRecipes.com. Ajinomoto(chinese salt ) - 1/2 tsp. Chillie Garlic Sauce - 1 tbsp. Corriander leaves chopped - For garnishing - appx.2tbsp! Fry till Golden brown & put aside. Spread sauce on the steak and serve hot with boiled vegiz or mashed potatoes or french fries or watever u desire. Garnish with Corriander leaves!! P.S. U can also use boneless peices of chicken instead of steaks and can be eaten with boiled rice as a proper meal.